There is a new potential development proposed that could adversely affect the Middlesex Fells on the horizon. 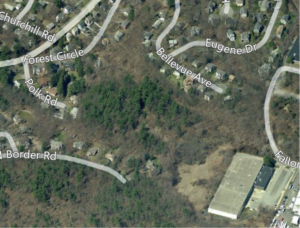 A large 13.3-acre parcel in Winchester bordered by Bellevue Ave, Forest Circle, Polk Rd and North Border Road, and Middlesex Fells Reservation which consists of 10 acres of mature second growth hardwoods on a hillside and 3.4 acres of wetlands that directly abut the Fells may be the home to a new 40-B project in Winchester. 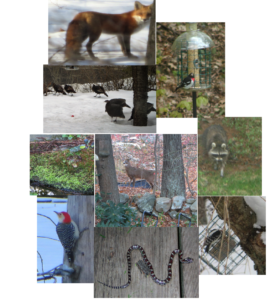 Today, the Friends of the Fells sent letters in opposition of the proposed Forest Ridge Residences to the Winchester Board of Selectman and to MassHousing and we invite you to do the same. Proposed site outlined in black. The wetlands in Winchester borders on the Middlesex Fells Reservation near Skyline Trail in the Bear Hill area. Aerial view of the site in winter foliage, showing wetland and extensive woodland. Residents from Stoneham and Winchester came out in force to a community meeting at McCall Middle School in Winchester on July 27th citing a variety of concerns including safety, traffic, and environmental concerns. The Friends of the Fells stands in full support of the many residents opposing this 40-B project. 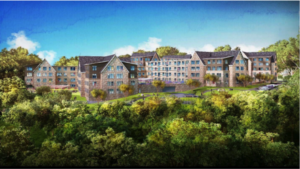 The Forest Ridge Residences is a proposal by Krebs Investor Group of Boston, formed April 27, 2016. Proposed is a 6 story, 296-unit wood frame apartment building with a steel and concrete underground parking structure for 451 cars, in 2 underground levels. Surface parking for 22 cars. No access is permitted through Winchester for vehicles with the exception of emergency vehicles via a restricted access road from Forest Circle. 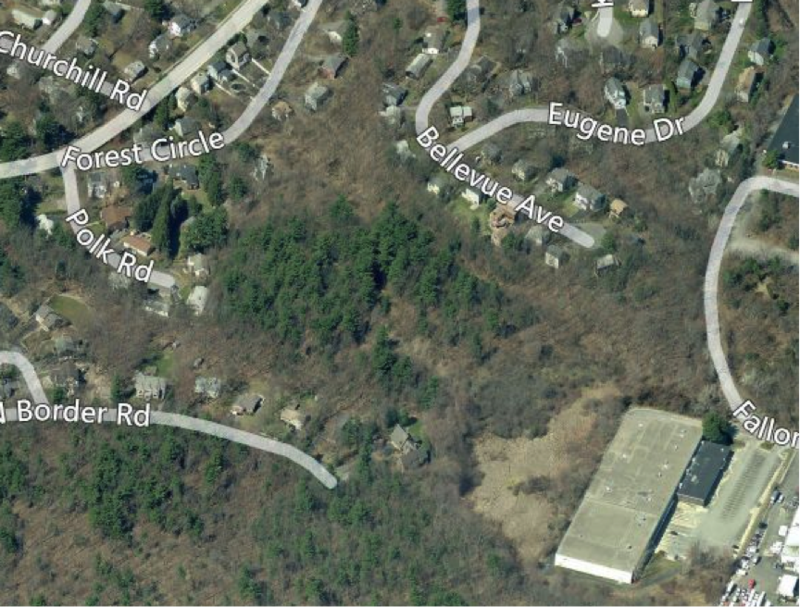 A small parcel in Stoneham off of Fallon Road, which is wetlands, is proposed to be the site of a new access bridge. Rental units would consist of studio, one-, two- and three-bedroom units with a total number of 473 bedrooms. Applicant’s artist rendering of the 296-unit complex from North Border Road. The trees in the foreground will not exist, as the complex is very close to homes on all sides in Winchester. Significant grading will result in the loss all trees within and surrounding the proposed work. 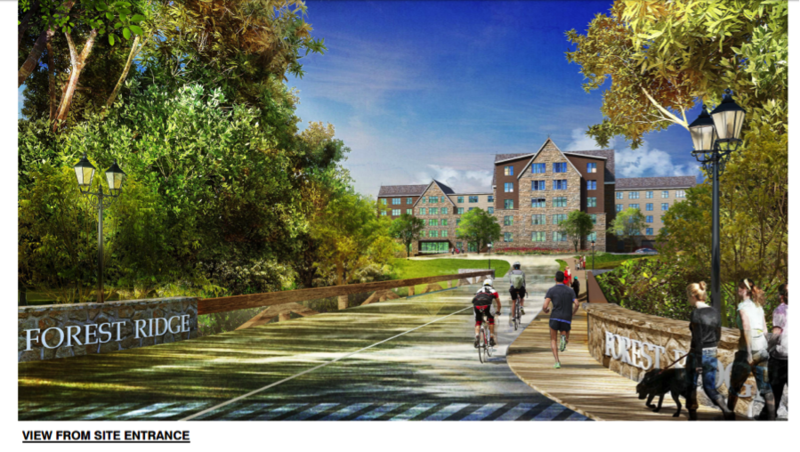 Artist rendering of the entrance over a proposed bridge from Stoneham onto the property. The maximum amount allowed (5,000 square feet) of wetlands is planned for destruction in Stoneham in order to construct a bridge that will access the site. All vehicles will enter and exit through this location in Stoneham, including during construction. We have particular concerns with the environmental impacts and the potential adverse affects of the proposed development. The proposed site is located on the border of Winchester and Stoneham, immediately west of Interstate 93 off of Fallon Road in Stoneham. A 298-unit complex nearing completion directly adjacent to the proposed site, in addition to the 296 proposed units could result in 900 new vehicles on Fallon Road. Fallon Road has 2 outlets, I-93 and Park Street (a Department of Conservation and Recreation Road). Park Street borders the northern edge of the Fells Reservation. People using the Fells Reservation currently park at a small lot on Fallon Road at Bear Hill. The 40B Application has 473 on-site parking spaces; however, it also says these spaces will be rented to residents. 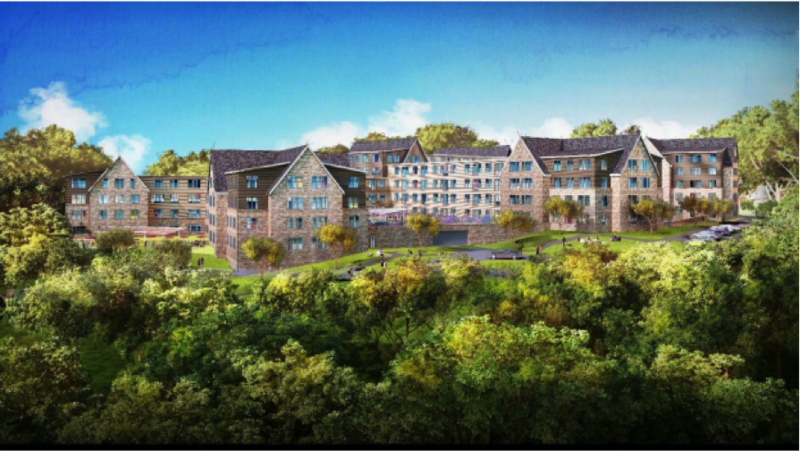 This fee compromises the affordability of the units; it is likely that residents and visitors will use any available surrounding parking options, including the lot at Bear Hill. Excessive noise from the site, both during construction as well as when it is fully inhabited, will be heard by people hiking the trails closest to the development, including Skyline Trail, Reservoir Trail, and Mountain Bike Loop. The building is six stories and may be visible to users of the adjacent trails and from various vantage points within the Fells. The site is a mature second growth hardwood forest. Nearly all the trees will be removed, except those in the wetland portion of the site and few along the property line. In the site’s current forested state storm water run-off is somewhat mitigated by the vegetation, but still floods downhill properties during major storms and snow melt. The steepness of the site and the amount of ledge make storm water management challenging, water cannot infiltrate. Except for the wetland area the majority of the site will be covered by impervious surfaces. Proposal relies on large underground storage takes for capturing storm water. Large volumes of blasting could affect the hydrology of the wetland. 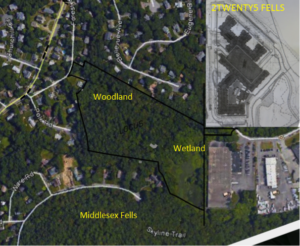 The maximum amount allowed (5,000 square feet) of wetlands is planned for destruction in Stoneham in order to construct a bridge that will access the site. The runoff from this proposal, that would contain pollutants such as road treatment chemicals in the winter, could flow directly into the wetlands. 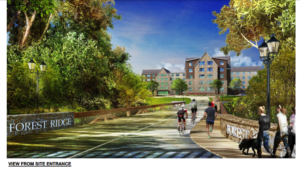 The plans call for recreating the destroyed wetlands from Stoneham on the Winchester parcel. If run off from impervious surfaces on the site is not treated it will pollute the wetland. If storm water is not allowed to enter, the wetland may no longer be wet. The size of the proposal does not leave room for surface storm water treatment of run off (such as filtration basins and bio swales). Large volumes of blasting could affect the hydrology of the wetland, if fissures are created instead of capturing and holding water, this wetland could drain toward Forest Circle and not toward the North Reservoir. Disturbance of possible contaminated soils could pollute the wetland. Hazardous building materials were illegally placed on the site. According to a 1993 Assessment, reportable concentrations of beryllium, copper, lead and zinc are present. Blasting, grading and construction will affect the location of these chemicals. Reduction of water levels in the wetland and changes in water quality could affect the Town of Winchester’s water supply. The wetland on this site is in a Zone A Contributing to the North Reservoir. Any development in Zone A requires more stringent treatment of storm water run-off. This is not acknowledged in the 40B Application and there is no space on the site for treatment. Prior fill and the run off from proposed impervious surfaces could pollute this wetland. Wildlife in urbanized areas rely on vegetated corridors, which allow them to move between habitats. This site functions as a corridor between the Fells and the large vegetated area on the Atlantic Gelatin site and connects the Fells to vegetated residential lots. Deer, fisher cat, raccoon, skunk, woodchuck, fox, coyote, bat, woodpeckers, red tail hawk, hummingbird, turkey, and songbirds are regularly seen by residents. Destruction of the 10 acres of habitat and degradation of 3.4 acres of wetlands on the proposed site will have impacts on wildlife well beyond the site itself. The density and amount of construction will sever the corridor and further isolate the Fells. 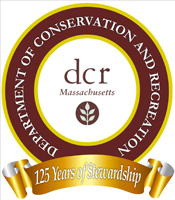 Changes to the on-site wetlands will affect plants and animals along Dyke’s Brook and the North Reservoir. We encourage you to also copy your letters to State Representative Michael Day at Michael.Day@mahouse.gov and Senator Jason Lewis at Jason.Lewis@masenate.gov as well as to the Stoneham Board of Selectman. No To Forest Ridge Residences Flyer Final-2.